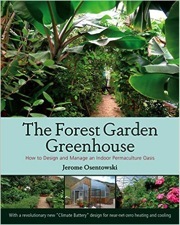 Abstract: Book review The Forest Garden Greenhouse by Jerome Osentowski. As a budding permaculturist, the quote above as well as Osentowski’s discussion of his beginning interactions with greenhouses strikes a chord, most especially when he states that “the greenhouse reveals itself as a microcosm of the living planet.” For me, this simultaneously opens space for hope for the living planet while offering an accessible means to explore that hope through real action in building, maintaining and learning in the greenhouse. This book provides a very practical overview of how to create a forest garden greenhouse through case studies of Osentowski’s varied greenhouses at the Central Rocky Mountain Permaculture Institute (CRMPI). Through these case studies and the detailed information about the different greenhouse designs and their pros and cons, climate batteries, soil, plant species, and Osentowski’s own trials, errors and successes, there is much to be learned about gardening in general and permaculture specifically. Each chapter takes a system-based discussion of a particular topic which is also paired with a permaculture principle. This structure positions the book to be highly accessible and digestible given the quantity of information contained therein. While there are no greenhouse plans in the book, this is an excellent foundational read that will likely give you the confidence to delve into the specifics and get growing regardless of your outdoor climate. Osentowski advocates and explains how building greenhouses can be done affordably with reused materials and plant propagation, and how a closer look at the resources within a community can lead to their reuse and integration in a greenhouse. Chapters 1 – 5 provide comprehensive overviews and critiques of greenhouse design options as they exist at CRMPI, with Chapter 5 beginning to break down the considerations for building your own greenhouse such as roof slope, material, glazing, microclimates and more. After Chapter 5, Osentowski begins to delve into the finer details of indoor forest gardening. Chapter 6 focuses on soil, and the reader is able to gain a small fraction of Osentowski’s extensive knowledge of how to make soil “the easy way” using synergies among worms, carbon and nitrogen. Chapter 7 details the elements of creating a forest in your garden and focuses on the permaculture principle of cultivating diversity. Cover cropping, coppicing, plant guilds, growing for beneficial insects and animals and much more – be prepared to take lots of notes for your own garden whether inside or out. (Be sure to check the appendix for the detailed Plant Community Attribute List!). Chapter 8 gives an overview of how water works at CRMPI and how you might want to structure watering and water management for your own greenhouse. Chapter 9 talks about greenhouse management, ongoing potential considerations and pest management using insectaries, “trap plants” and pest predators. Chapter 10 concludes with additional off-site case studies that illustrate lessons learned for each of those sites. In much the same way that Osentowski’s book is the result of a “cocreative, collaborative process”, forest gardens and permaculture require a deep understanding of how design, climate and plant guilds work creatively and collaboratively together to achieve maximum success. It is this interdependence and resiliency discussed in The Forest Garden Greenhouse which places permaculture and its systems and principles so appropriately within the realm of sustainability studies.